1 of 3 Heat grill or broiler to medium-high heat. In a small bowl, whisk together mayonnaise, horseradish, scallions, sugar and salt. Set aside. 2 of 3 Place potatoes in a saucepan and add enough water to cover. Bring to a boil and boil 12 to 14 minutes, until potatoes are tender when pierced with a knife. Drain, rinse and cool. 3 of 3 Meanwhile, rub pork with Montreal seasoning. Grill or broil pork for 20 minutes, turning occasionally, or until meat is cooked through and registers 145 degrees on an instant-read thermometer. Cover and let rest at least 5 minutes before slicing. Gently combine potatoes and dressing. 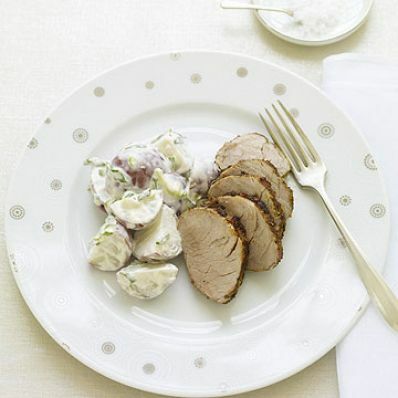 Slice pork and serve with potato salad.